What is the allowable range of transformer turn ratio difference? Transformer below 35KV, the voltage ratio is less than 3, the allowable deviation of plus or minus 1%, all other transformer voltage than the allowable deviation of plus or minus 0.5%. Product Introduction according to IEC and relevant national regulations, semi-finished products and finished products in the transformer production process and transformers newly installed and overhauled must be tested for transformer ratio ratio before being put into operation. 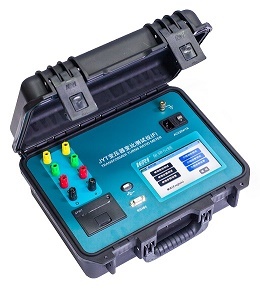 Kingrun's JYT-F automatic three-phase turn ratio tester provides stable and accurate transformer ratio testing services, it use single-chip microcomputer as the core of processing to control the whole machine. The single-phase or three-phase transformer ratio measurement can be completed in one time. This instrument can meet the needs of various large, medium and small transformer ratio test. § Apply to distribution transformer and 1000KV transformer, CT,PT,Z group transformer ratio test. § Storing 50group and downloading test results via RS-485 or USB port. The JYT-F three-phase transformer turns ratio tester is designed to measure the turns ratio of power transformer, and distribution transformers in a substation or transformer manufacturing site. The JYT-F turn ratio tester are ideal tester for use by power transformer manufacturers. The rapid, precise testing and big storage capability make an operator to set up and test multiple three-phase transformers efficiently. The high temperature resistance and cold temperature design makes JYT-F turn ratio tester well suited for use in a variety of harsh environments (±60℃).